Bernardaud ... at The Dubai Mall. 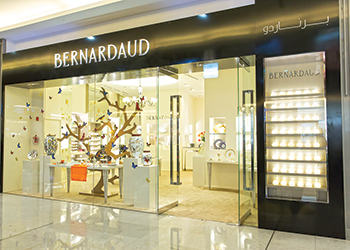 French porcelain manufacturer Bernardaud has opened its first boutique in the UAE at The Dubai Mall. The new boutique offers Middle Eastern customers the best in porcelain from Limoges, a city in southwest-central France known for its decorated porcelain. At the boutique, a diversified range of products and collections will be sold, giving luxury lovers and connoisseurs in Dubai a wider selection of designs. Located on the first floor of Dubai Mall, the boutique is designed to allow visitors ample space to move and explore the collections on display in a white, subtle lighting set in pure and simple decor. “We are very happy to be present in Dubai. Our local customers will love the experience of using porcelain everyday and for all occasions,” says Michel Bernardaud, chairman and CEO, Bernardaud. “The company is famous for the quality, creativity and diversity of its collections, which range from traditional to luxurious designs with incrustation to ultra-contemporary styles. Since we offer a broad selection of high-quality goods, our customers are sure to find something that appeals to them,” he adds. For more than 150 years, Bernardaud has been synonymous with Limoges porcelain where it is still manufactured. In its workshops, Bernardaud mixes tradition and innovation to offer products that range from tableware to home furnishing (light fixtures, furniture) and to create bespoke shapes and decors for clients, hotels and restaurants. Founded in Limoges in 1863 and still family owned, Bernardaud has always striven for excellence, quality and precision. Working in a field that is perpetually evolving, the company holds a niche for design and innovation, developing technologies that push back the technical limits of the art of porcelain making. “Each collection, piece of furniture, lighting creation or decorative object that bears the Bernardaud signature brings the grace of simple luxury to everyday life and demonstrates that, after two thousand years, porcelain continues to prove its worth as an exceptional material,” he concludes. Bed bugs can bite your investment!